Don’t worry, just because I had another post this morning doesn’t mean I forgot that this is Thursday, the highly anticipated day of the weekend roadtrip post! Fear not, dear Tar Heel roadtrippers, we’ve got a special “oke”-alicious lineup for this last segment of our Beach Book Grab Bag series. 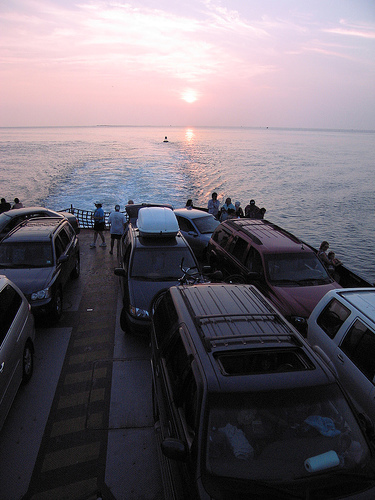 We’re featuring two Outer Banks islands: Roanoke and Ocracoke. The Lost Colony: A Symphonic Drama of American History, by Paul Green, edited by Laurence G. Avery – Read the full text of Green’s famous play depicting the founding and disappearance of the Roanoke Island colony. Then go catch a performance of the outdoor drama in Manteo. The drama has been performed there every summer since 1937 — except during World War II, when the threat of German u-boats made it too dangerous. The show runs 6 nights a week, Sunday-Friday, at 8:30 pm, through August 20. A New World: England’s First View of America, by Kim Sloan – This beautifully illustrated book reproduces in full the famous and rarely seen British Museum collection of drawings and watercolors made by John White, who in 1585 accompanied a group of English settlers to found the colony on Roanoke Island. Sloan’s introduction is followed by three specially commissioned essays covering John White himself, the indigenous inhabitants he depicted, and the historical context of his visit. Oversized (8 x 11), with 250 color illustrations. Time Full of Trial: The Roanoke Island Freedmen’s Colony, 1862-1867, by Patricia C. Click – In 1862, a Union victory at the Battle of Roanoke Island gave the hope of freedom to hundreds of slaves in surrounding areas, who streamed across the Federal line to establish a new free colony. Click tells the story from the colony’s contraband-camp beginnings to the conflict over land ownership that led to its demise in 1867. Ocracokers, by Alton Ballance – When tourists discovered this “unique fishing village by the sea” in the late twentieth century, things on Ocracoke started changing. In this book, Ocracoke native Alton Ballance pays tribute to the everyday life in the old village community — before it started drawing hundreds of thousands of visitors every year. Hoi Toide on the Outer Banks: The Story of the Ocracoke Brogue, by Walt Wolfram and Natalie Schilling-Estes – By tracing the history of the brogue spoken on Ocracoke Island, the authors offer a look at the role language plays in a culture’s efforts to define and maintain itself. This linguistic study traces the Ocracoke brogue’s development, identifies the elements of pronunciation, vocabulary, and syntax that make it unique, and provides a comprehensive glossary. You can get to know Walt Wolfram on this radio podcast.